Hey everyone! Today is a review on the City Colors Cosmetics eyeshadow trio in Falling Leaves. I received this is my January ipsy bag and have fun trying it out. I’m actually kind of phasing out of eyeshadows for the most part. I tend to go for a lot more neutral colors these days and don’t put much variation in my everyday looks. I liked the oranges of the Falling Leaves trio because they were still on the “neutral” side kind of with just a bit of warmth. This is a perfect palette for fall obviously but I think they’re great winter shades too. This trio contains a matt pumpkin base shade, a light peachy orange, and a dark bronze brown shade. Overall, I thought these were nicely pigmented, especially the darker color, which also happens to be my favorite of the three. These pigments apply pretty smoothly. The matte orange isn’t quite as pigmented as the other two so it does take at least two layers to get the rich orange. I didn’t find a difference in color payoff between using primer and not using it. At least the few times I’ve used them so far, I haven’t had an issue with much fallout which is definitely a plus for me. When I wore these colors on Friday, I used Thank Me Later eye primer. After 4 hours, I found these colors still looked the same with no creasing. After 8 hours, there was a bit of creasing. This may have been the fault of the primer. Today, I have applied the colors without primer and at three hours, color still looks good. I’ll update at the end of the the night if it showed creasing without using a shadow primer. City Cosmetics lists this trio on their website as $5.99 which I think is a great price and is pretty accurate as to what I would say its worth. Its better than some of the cheapo brands but not quite as pigmented as higher end eyeshadows like Too Faced. For $6, this little trio is a pretty good deal and a great compromise if you’re looking for a convenient eyeshadow palette. I thought this was a nice little eyeshadow compact with three shades that compliment each other very nicely. 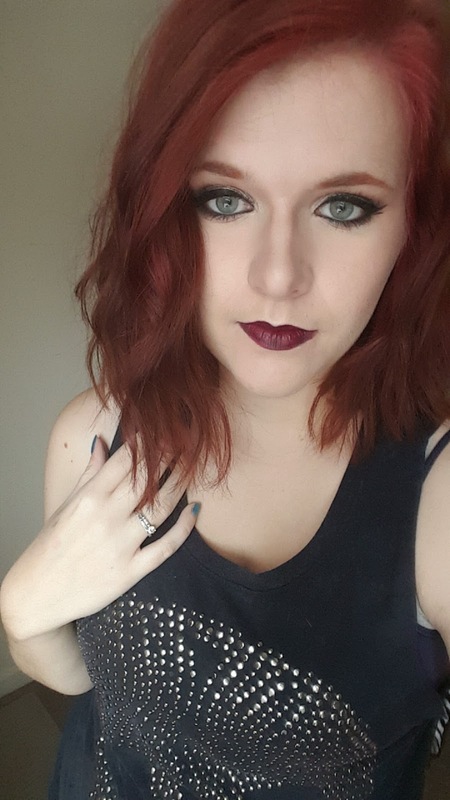 I have red hair, green eyes, and fair skin and the colors worked very well on me. They blended fairly nicely although the matte shade was a little bit harder to work with and not as smooth. Pigmentation was midrange, I’ve seen worse but I’ve definitely seen better. Would I buy this again? Maybe. If I found a good deal on the price then sure. I have a couple other products from City Colors Cosmetics so I feel like I’d try other eyeshadows based on this review. Second day hair refreshed using bastiste Dry Shampoo and curled random pieces of the top layer with a 1″ clipless tapered curling iron. I have a review coming on a couple of these but let me know if there is anything in particular you want to see. Have a fun week everyone! P.S. Follow the twitter account @tsjbblogger and instagram @thescarletjamie. I also have a new official email for site related love, comments, and inquiries: thescarletjamie@gmail.com. Follow these accounts or shoot me an email to say hi! hair TIPS + my new haircut! For today’s post I wanted to share with you some hair related tips for those looking to keep their hair healthy and beautiful – some dos and don’ts if you will. Here is a great graphic from Madison Reed that talks about ten “hair myths” that are commonly found circulating the web. I’ll be listing my few of my favorite tips here but take a look at the graphic to see the full list. ALSO at the end of this post I’ll be unveiling my new hair cut and color!!!! al processes – hair growth isn’t one of them. Eating healthy, drinking water, and getting the right amounts of minerals means your body will be able to allocate resources to stronger, shiner and overall better hair. DO trim your hair! Trimming your hair won’t make your hair grow any faster technically, but what it does do is makes your hair look fuller. When you grow out your hair, many strands will experience breakage during the growth process, causing the bottom third of your hair to be significantly thinner than the middle. If you grow your hair out super long but never trim it, the bottom section will end up looking scraggly and unflattering. DON’T use heat. This is a hard one. I don’t know about you but I love me a nice curling iron. Unfortunately the damage from overusing straighteners and other tools can be irreversible. If you have to use heat tools, use a heat protecting product and don’t use the highest temperature setting (chances are you don’t actually need it that high for it to be functional anyway). I’ve been using TRESemme for several years now and its a favorite. DON’T over process your hair. Bleaching or leaving hair dye in for too long, or bleaching too often can seriously kill your hair. It can leave it porous, dry, brittle, and lifeless. I’m sure you’ve all heard the horror stories of your best friends, ex-friends, mother’s dog sitter who burned her hair off with bleach. Its important to take it slow and let your hair have some downtime. I know its hard to be patience when you have a dark color and you really need platinum like now. But give your hair time to rejuvenate between bleaches and dyes and it will thank you for it. Now, for my hairs. Ta-da!! Probably most of you don’t know this, but I chopped off my hair at the end of December just before Christmas. I was in the mood for a post-wedding hair change and cut off about ten inches to a “semi-blunt bob”. Here is a picture from today that showcases the cut one month later. At the time it was cut it was a faded mousey brown and hit about the middle of my back. Because I was dying (#pun) to get back to my beloved scarlet, I had the stylist try to copy a previous red color I had. It ended up not being red enough and looked too brown after a week so I re-dyed it myself. Here you can also see the color my hair is now. This is about three weeks after dying with Loreal HiColor in red. As you know I try a lot of different boxed hair dyes so this was the first time I had used dye that had to be mixed with developer. It has now faded from a bright ariel red to a the perfect rich coppery auburn that I love. I’m still unsure if I’ll be using this to redye in a couple of weeks but if anyone wants a review/tutorial let me know. P.S. Related. Madison Reed has a fun hair quiz you can check out to see what color you should try next.